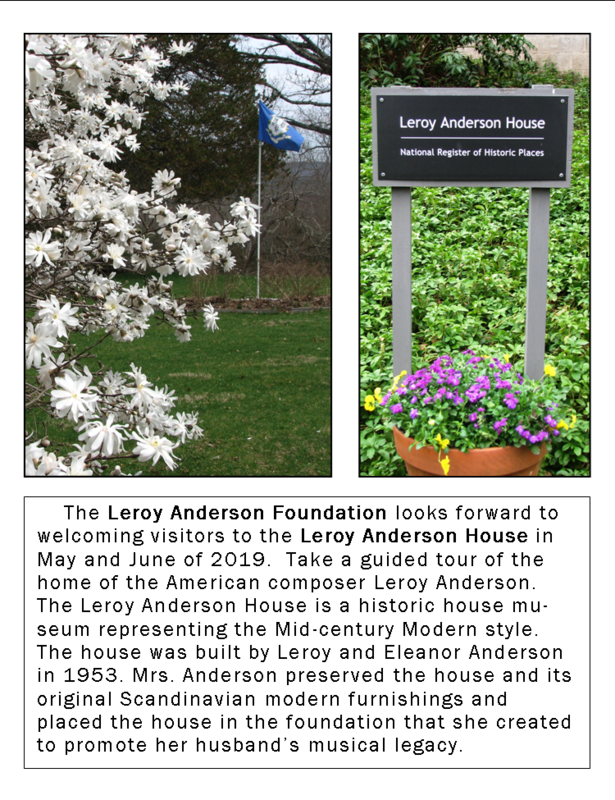 The Leroy Anderson Foundation will open the Leroy Anderson House to the public on several weekends in late May and June of 2019. Eleanor Anderson will be celebrated on the weekend of May 25 and 26, 2019 when the house will be open to the public. Visit the Leroy Anderson House to learn about Leroy Anderson, his music, and to see where he and his wife Eleanor and their children lived. With Mr. Anderson's music playing in the background, visitors will enjoy touring the house and grounds and learning about Mr. Anderson's life in Cambridge, Massachusetts, his Military Intelligence service in World War II, and his life in Woodbury from 1946 on. Special musical performances are planned for Sunday, May 26, Saturday June 8 and Saturday June 29. The Juilliard School's MAP Wind Ensemble Orchestra and String Ensemble will perform "Fiddle-Faddle" and "Arietta" by Leroy Anderson at their spring concert on May 4, 2019 at 4:30 p.m, at the Peter Jay Sharp Theater at Lincoln Center. This performance was the result of a visit to the Leroy Anderson House by cellist and Juilliard music student Joseph Darcourt and his parents. Joseph is a member of the Music Advancement Program (MAP) Wind Ensemble Orchestra and the String Ensemble. Joseph Darcourt has been named the first place winner of the international American Protégé concerto and Musical Talent competitionS. After performing at the Leroy Anderson House at an Advent concert on December 8 and 9, 2018, Joseph began to learn "Arietta" by Leroy Anderson as a solo performance for cello. He then brought the composition to Murray Colosimo, conductor of the Juilliard's MAP Orchestra, for his consideration. The result is that the Juilliard's MAP Wind Ensemble Orchestra and String Ensemble will perform "Fiddle-Faddle" and "Arietta" by Leroy Anderson at their spring concert on May 4, 2019 at 4:30 p.m, at the Peter Jay Sharp Theater at Lincoln Center. The concert is free and open to the public. Tickets are not necessary. The Parnassus String Quartet of New Haven, Connecticut presented "An Afternoon with Mozart and Brahms," on Sunday, April 7 at the Woodbury Senior Community Center. The free concert was made possible by the Leroy Anderson Foundation. The members of the quartet - Emily Switzer (1st violin), Gregory Lewis (2nd violin), Marta Lambert (viola) and Bo Bae Lee (cello) are second-year Masters of Music students at Yale University School of Music. They were awarded first prize in the annual Yale University String Quartet Competition. The quartet was joined by Vincent de Luise (clarinet). The ensemble presented the Mozart "Quintet for Clarinet and String Quartet in A major" and the Brahms "Quintet in B minor". Music series chair Lynne Kearney welcomed the 130 people who attended the concert and thanked the Leroy Anderson Foundation on behalf of the Friends of the Woodbury Senior Community Center. 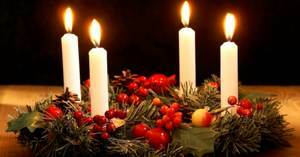 Cynthia Bos will present a concert of piano music for Advent at the Leroy Anderson House on Saturday, December 8, 2018 at 1:00 PM. Cynthia Bos is an accompanist, arranger and composer who plays and writes beautiful music for her own enjoyment and that of others. She plays several instruments, including the piano, flute and guitar. Cynthia specializes in liturgical church music and in composition and improvisation. She has a particular interest in improvisational collaboration with other musicians. She also seeks to encourage and develop the musical skills of others. While Cynthia often plays for church and outside events, she most enjoys sharing her music with family and friends. Cynthia and her family live in West Hartford, Connecticut. Admission is free. Reservations are encouraged. To reserve a place, send an email to: info [at] leroyandersonfoundation.org. Pianist Yulia Fedorov of Trumbull, Connecticut presented a program of classical music at the Leroy Anderson House in Woodbury, Connecticut on Sunday, September 9, 2018 at 2:00 pm. She presented works by Schumann, McDowell, Liszt, Grieg, Chopin, Beethoven, J.S. Bach and Leroy Anderson. This was the first public music performance at the Leroy Anderson House since the Anderson home was designated a Historic House Museum by the Town of Woodbury. The concert included the premiere of Ms. Fedorov's arrangement of the 2nd movement "Andante" of Leroy Anderson's Piano Concerto in C. A capacity audience gave Ms. Fedorov a sustained ovation after her brilliant performance. "Her program was delightful and her performance was perfect", said Rolf Anderson, Vice President of the Leroy Anderson Foundation. "We look forward to Yulia Fedorov's next performance at the Leroy Anderson House." A native of Ukraine, Yulia Fedorov earned a degree in Piano Performance and Music Theory at Dnipro Conservatory of Music. She next received her Master's degree in Music Education, Music Theory, Composition and Music History from Lviv Conservatory of Music. In Connecticut she earned her Master of Science in Music Education at Western Connecticut State University. 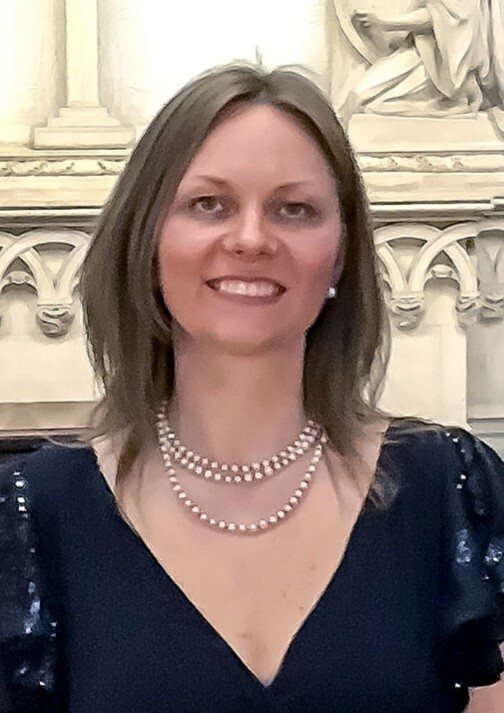 Since 2002 Yulia has been teaching piano and music in Westport and Trumbull, Connecticut and performing in multiple concerts as a soloist and an accompanist. Yulia has been enjoying teaching music and inspiring her students for over twenty years. She lives with her husband and three children in Trumbull, Connecticut. 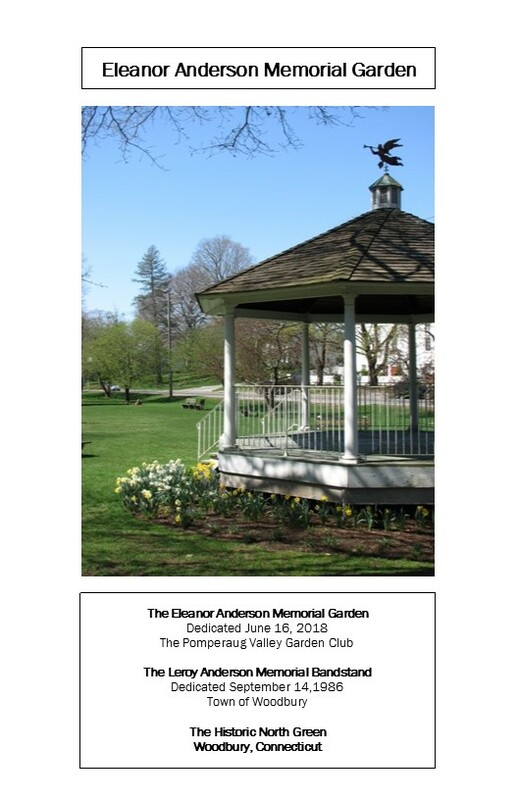 The Pomperaug Valley Garden Club of Woodbury, Connecticut will dedicate the perennial garden at the Leroy Anderson Memorial Bandstand to the memory of Eleanor Anderson on Saturday, June 16, 2018 at 2 pm. 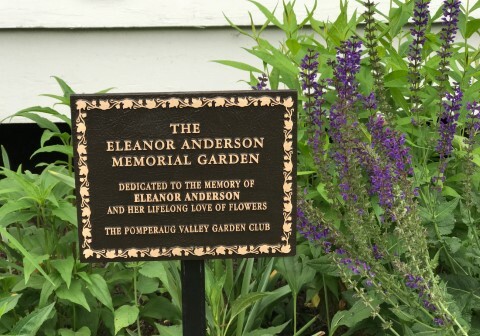 Eleanor Anderson was a member of the Pomperaug Valley Garden Club for over 40 years and was responsible for creating and maintaining the Botany Trail at the Flanders Nature Center in Woodbury. Eleanor Anderson lived in Woodbury from 1949 until her death in 2014. She raised four children, was active in several organizations including the Woodbury League of Women Voters, the Waterbury Symphony Orchestra, L'Alliance Francaise, and the Cub Scouts. She was the wife of composer Leroy Anderson. The public is invited to attend the dedication on Saturday, June 16 at 2 pm on Woodbury's historic North Green at 11 Main Street South. Present will be members of the Pomperaug Valley Garden Club, members of the Anderson family, representatives of the Town of Woodbury and of the Waterbury Symphony Orchestra. There will be a short concert of music by Leroy Anderson. The event is free and open to the public. Reservations are not necessary. Parking will be along "Green Circle", the gently curving town road along the East side of the North Green. Refreshments will be provided by the Pomperaug Valley Garden Club. Bring a lawn chair if you like. The Pomperaug Valley Garden Club has worked hard to make the gardens on many of Woodbury's town greens and parks some of the most beautiful in Connecticut. The garden club was awarded the "HISTORIC, MEMORIAL, AND PUBLIC GARDENS AWARD OF EXCELLENCE" by the Federated Garden Clubs of Connecticut, Inc. in 2016 for a "...significant installation at the Leroy Anderson Bandstand in Woodbury" on Woodbury's historic North Green. It is this garden that was dedicated to Eleanor Anderson. Please join the Anderson family in supporting the Pomperaug Valley Garden Club and their work "to promote an interest in gardens, horticulture, floral and landscape design, to cooperate in the protection of wild flowers, trees and birds and to encourage public plantings, beautification and conservation." Send a donation and/or become a member of the garden club by visiting their website at: www.pomperaugvalleygc.org. The Northeast Connecticut Community Orchestra will present a concert titled "From Bach to Blue Tango" at the Southbury Public Library on Thursday, June 21, 2018 at 7:00 pm in the library's Kingsley Room. Based in Woodstock in Connecticut's "Quiet Corner", the Northeast Connecticut Community Orchestra was founded in 2012 by music teacher Yaroslav Tereshchenko, then of Mansfield, CT. Since then, the string orchestra has played one spring and one winter concert each year, performing music written by composers ranging from Vivaldi and Mozart to Scott Joplin and the Beatles. After the 2016 Christmas concert, Tereshchenko joined the Omaha (Nebraska) Conservatory faculty. Dylan Lomangino of Mansfield, CT became the orchestra's conductor and music director. Along with playing viola and teaching music in Connecticut schools, he now considers conducting to be his calling. Comprised of 20 musicians performing on violin, viola, cello and double bass, the Windham County-based ensemble will bring approximately 10 members to the Southbury performance. The Northeast Connecticut Community Orchestra is a 501(c) 3 non-profit organization. The concert in Southbury will be their first performance in Western Connecticut. This concert is made possible by the Friends of the Southbury Public Library and the Leroy Anderson Foundation. Light refreshments will be provided. Like all Southbury Public Library programs, this presentation is free to attend and open to anyone regardless of town of residency. Registration is required. Please call 203-262-0626 ext. 130 to register or visit the Reference Desk. 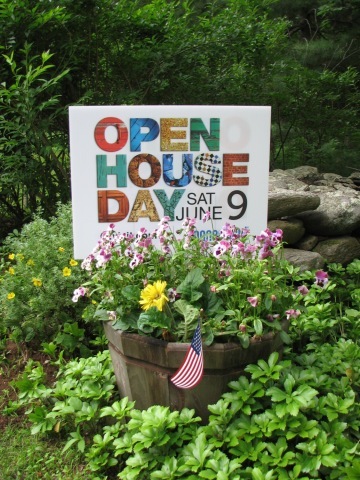 The Connecticut Open House Day saw 34 people visiting the Leroy Anderson House on Saturday, June 9, 2018 to learn about Leroy Anderson, his music, and to see where he and his wife Eleanor and their children lived. With Mr. Anderson's music playing in the background, visitors enjoyed touring the house and grounds and learning about Mr. Anderson's life in Cambridge, Massachusetts, his Military Intelligence service in World War II, and his life in Woodbury from 1946 on. We look forward to opening the house to visitors again starting in late August and continuing through the autumn of 2018. The Foundation seeks to create partnerships with others to further the foundation's goal of honoring Leroy Anderson and supporting music and music education. The Leroy Anderson Foundation is pleased to support music performances and music education in 2018 at the Leroy Anderson House in Woodbury, Connecticut, at the Woodbury Senior Community Center in Woodbury, Connecticut; at the Gunn Memorial Library in Washington, Connecticut; of the Naugatuck Community Choir in Naugatuck, Connecticut; of the Northeast Connecticut Community Orchestra in Woodstock, Connecticut; of the Connecticut Valley Symphony Orchestra in West Hartford, Connecticut; and at the Southbury Public Library in Southbury, Connecticut. Please contact the respective organization for dates of upcoming performances. Creating a U.S. Postal Service commemorative stamp for Leroy Anderson. Adding Leroy Anderson’s name to the Hatch Shell on the Charles River Esplanade in Boston. This was where the Boston Pops gave free summer concerts and where the annual July 4th concert is presented. Establishing a series of a music concerts in Leroy Anderson’s honor. Exhibits about Leroy Anderson have been created and presented in various places, including: the American Swedish Institute in Minneapolis, Minnesota; the Yale University Music Library in New Haven, Connecticut; Kristianstad City Library in Kristianstad, Sweden; Mattatuck Museum in Waterbury, Connecticut, Whittemore Memorial Library in Naugatuck, Connecticut and in Woodbury, Connecticut where the composer lived for many years. Please contact the Leroy Anderson Foundation if would like to host an exhibit about Leroy Anderson as part of your performance of his music. 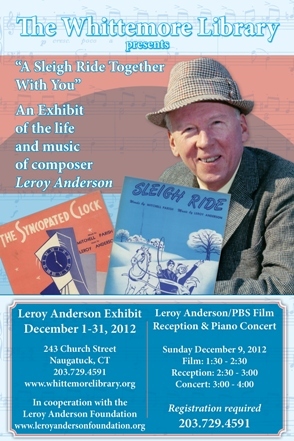 The Leroy Anderson Foundation is pleased to partner with the Mattatuck Museum in Waterbury, Connecticut in presenting an exhibit featuring Leroy Anderson. With materials borrowed from the Leroy Anderson Foundation, the Mattatuck Museum is honoring the life and music of Leroy Anderson who made his home in nearby Woodbury, Connecticut. The museum describes the exhibit with these words: "Leroy Anderson was a composer of orchestral songs without words that have permeated the American culture. Using music, photographs, archives and other memorabilia, this exhibition explores the career of the man whose music has become a part of our everyday life." The Mattatuck Museum is located at 144 West Main Street in downtown Waterbury, Connecticut on the north side of the Waterbury Green. The Mattatuck Museum is closed on Mondays. The museum is open Tuesday - Saturday: 10:00 a.m. - 5:00 p.m., Sundays: 12 noon - 5:00 p.m. Please note that the galleries are cleared 15 minutes before closing. The museum will be closed on Christmas Day and New Year Day. Admission: Museum Members: Free, Adults: $7, Seniors (65+) and Students with valid College I.D: $6, Children under 16: Free. The Howard Whittemore Memorial Library presented an exhibit from December 1 to December 29, 2012 about the life and music of Leroy Anderson in cooperation with The Leroy Anderson Foundation. The exhibit was titled "A Sleigh Ride Together With You". A reception for the exhibit took place Sunday, December 9, 2012 at 2 pm at the Whittemore Library. Rolf Anderson and Kurt Anderson, two sons of the composer, presented the PBS documentary film "Once Upon A Sleigh Ride" about their father. This film was produced and directed by Peter Rosen. Following refreshments, William Braun presented a program of music for solo piano. Mr. Braun presented works by Leroy Anderson, Aaron Copland, Leonard Bernstein, Virgil Thompson and Ned Rorem. The Howard Whittemore Memorial Library is located at 243 Church Street, Naugatuck, Connecticut. The library is adjacent to the town hall and across from the town green. Parking is on the street. The library is open on Monday 12 - 6, Tuesday and Wednesday 10 - 8, Thursday 10 - 6, Friday 10 - 4, and Saturday 10 - 2. For other information call: 203.729.4591. www.whittemorelibrary.org/. The Woodbury Public Library in Woodbury, Connecticut presented an exhibit about the life and music of Leroy Anderson in 2012. The exhibit was titled "A Sleigh Ride Together With You". A reception for the exhibit took place Saturday, January 21, 2012 at 2 pm at the Woodbury Library. Rolf Anderson, a son of the composer, presented a short video and spoke about his father. Both the exhibit and the reception were open to the public free of charge. The exhibit was on display for the months of January and February 2012. The National Park Service named The Leroy Anderson House to the National Register of Historic Places on December 31, 2012. 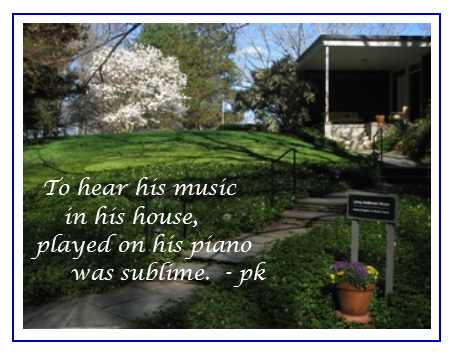 The house contains an exhibit about Leroy Anderson and is occasionally open to the public. For information about visiting the Leroy Anderson House, see the Woodbury page on this website. The Leroy Anderson Memorial Bandstand on Woodbury's historic North Green was built by the Woodbury Lions Club in 1986. The West Point Military Academy Band gave a concert on the North Green in 1986 as part of the dedication ceremony to honor Leroy Anderson. The West Point Military Academy Band performed several compositions written by Leroy Anderson as well as traditional patriotic music. The concert was attended by several hundred residents. Leroy Anderson was a Captain in the U.S. Army during World War II. He served in Iceland in the U.S. Army Counter Intelligence Corps and as Chief of the Scandinavian Desk of Military Intelligence at the Pentagon in Washington, D.C. The Leroy Anderson Memorial Bandstand is within Woodbury's Historic District #1 which is on the National Register of Historic Places. The Leroy Anderson Memorial Bandstand on Woodbury's North Green is maintained by the Town of Woodbury which owns the Woodbury North Green. The Pomperaug Valley Garden Club maintains a beautiful garden of perennial and annual flowering pants at the Leroy Anderson Memorial Bandstand. The Federated Garden Clubs of Connecticut gave the Pomperaug Valley Garden Club an award in 2015 for the flower garden at the bandstand. The Leroy Anderson family is pleased to provide financial support to the Pomperaug Valley Garden Club for their good work in maintaining flower gardens at all of Woodbury's Town Greens. The Leroy Anderson Foundation is writing a history about the composer Leroy Anderson. The book will include a chapter describing the popularity of Leroy Anderson's music in Europe. We would like to include information about performances of his music with a special focus on the centennial year 2008. Please help by sending information about your performances of Leroy Anderson's music. We appreciate receiving text in the original language. Physical copies of concert programs are of special interest for the archives. We appreciate, however, receiving a digital file via e-mail. If we receive information about future concerts well in advance, we can help to publicize the concert through the newsletter page of the official website for the composer: leroyanderson.com. Musicians as well as listeners may send comments about Leroy Anderson's music in their native language to the Guestbook page of the composer's official website: leroyanderson.com. Your comments will help us to present a European perspective about Leroy Anderson's music. The "Hatch Shell" on the Charles River Esplanade in Boston, Massachusetts was where the Boston Pops gave free summer concerts and where the annual July 4th concert is presented. Many important musicians have been honored by having their names placed on the "Hatch Shell." The Massachusetts Dept of Conservation and Recreation has recently announced that Leroy Anderson is one of 10 composers whose names will be added to the "Hatch Shell". The Leroy Anderson Foundation is working with several partners in Boston to make this happen. You can help get Leroy Anderson’s name on the "Hatch Shell" on the Charles River Esplanade by making a contribution to the Leroy Anderson Foundation. Thank you.